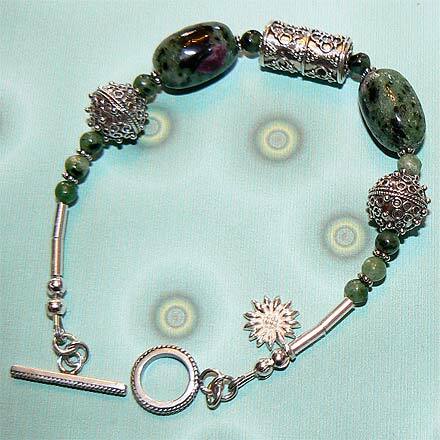 Sterling Silver Ruby in Zoisite Bracelet. This set has been *SOLD*, but we have many more items available. Lots of ornate silver highlights this lovely green, black and rose-colored stone. 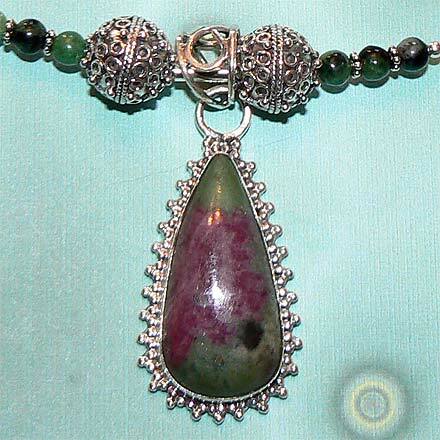 Zoisite is the black and green matrix, and Ruby, the pink/magenta color, can be found amongst it. [[b]]Necklace Length:[[/b]] 19.1"[[br /]] [[b]]Pendant Length:[[/b]] 1.8"[[br /]] Bracelet Length: 7.4"
For those who are interested in Astrological significances of stones, Zoisite corresponds with Aries.